Explore the map below to see how the distribution of incomes in American cities has changed since 1970. Select one of the eight cities shown and toggle between years. The color and height of each region correspond to that area’s median household income, adjusted for inflation. Each city is divided up by its Census tracts, small territorial units of roughly-equal population (about 4,000 people each). The color and height of each Census tract correspond to the inflation-adjusted median household income of its residents. Such a large disparity between the average and median incomes is possible because the economic gains have not been shared evenly. They have been realized predominantly by high-income households, with only a small share going to the lower majority of the income spectrum. 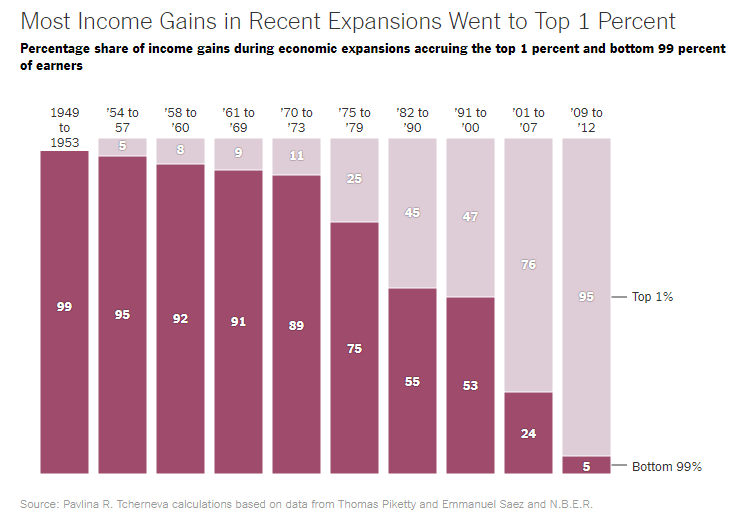 And this uneven split has grown increasingly imbalanced over time, as shown in the following chart from The Upshot. In the most recent period examined, between 2009 and 2012, a full 95% of the country’s economic gains were claimed by the top 1 percent of households. The result is an income distribution that looks like it’s been “squashed,” as illustrated brilliantly in this animated chart by the FT.
Like the map above. this graphic shows the distribution of median household income across each city’s Census tracts. It includes the eight cities from the map as well as 12 additional major US cities. Is America’s middle class being “crushed”? Controversial essay by Paul Graham, founder of the startup accelerator Y Combinator, essentially arguing that as long as a society has economic mobility, inequality is a good thing. It’s drives of innovation and fuels the country’s economic engine. Article by Nobel laureate Joseph Stiglitz, someone I had the pleasure of meeting a few years ago, discussing inequality not as merely an economic problem, but one that comes down to fairness and social cohesion. Household income data comes from: LTDB at Brown University and IPUMS National Historical Geographic Information System. For some of the cities, I used the urban agglomeration boundaries (as defined by the US Census), rather than the boundaries of the city proper. In these cases, the cities’ administrative boundaries included large areas of non-urban land, some of which may not have had tract-level data available as far back as 1970. Wonder how much of the change is upward mobility. If so, maybe this is a good thing. If the distribution in cities is being squashed, then why is the growth in <45k households of the income-by-city histograms not reflected in the 2015 FT animation? Overall, the area under the 1971 curve below 45k is much less than the <45k bars added up. Do you think that the changes in the different cities (for example, San Fran/Seattle vs. Chicago/Dallas) are negating each other, or are households in that 45-80k range just making the switch to suburbia and commuting? It might be worth defining the cities as contiguous zipcodes with population density above some threshold in 2015. It could be that cities like San Fransisco/Seattle with runaway housing prices and no dedication to rent subsidies are forcing low income households out of the city limits. Good observation. And it has a good explanation. The FT chart shows the distribution for the entire country. That includes all the cities shown here plus every other US city as well as all non-urban households. In general, the distribution in cities has been more “squashed” than that of non-urban areas. So when you add up all the cities, you would expect to see an overall larger growth of incomes at the low end and at the high end. Yeah, NYC was the city I was thinking of when I mentioned rent subsidies (even if that’s technically not what they have) in contrast to places like San Francisco and Seattle, which have some rent controls but generally still allow it to creep upwards. Thought difficult to quantify, I suspect that one of the reasons that wages feel more unfair now is due to decreased/stagnant wages for manual labor. For instance, a maid in 1976 was paid around $6500/yr. In 2016, a maid is paid around $24000/yr, which underperforms CPI by about 10%. Given the increases in literacy and education levels, our current maids are likely more skilled than maids were in the 70s. So now you have more qualified individuals doing the same job for less money. Maid is a profession that I chose because it existed both in the first data set and in the much more granular second data set, but I suspect that there would be a similar story for every profession that hasn’t been notably changed by the digital revolution of the last two decades, which are mostly jobs that revolve around manual labor. The idea that wages/labor have dropped while real GDP has tripled does seem unfair. There’s nothing sinister afoot here. It’s really about job migration and the toll it takes on low-skilled labor. My dad worked in a factory in Worcester, MA, for 30 years, beginning around 1945, and made good money. The plant got old and labor got greedy. So the factory closed shortly after he retired, and that building is now the home of low-paying little boutiques. The same story has played out for at least a century throughout the “rust belt.” My wife’s father, with a 9th grade education, was a foreman maintaining looms in what was then the world’s largest textile mill, in Lawrence, MA. The textile industry abandoned New England in the 1950’s and moved to the Carolinas, taking those good paying labor intensive jobs with it; he finished his remaining working years as a janitor at Raytheon. History repeats, and most of those textile jobs have left the Carolinas for China and other countries with cheap labor and lower costs of doing business. It’s not “fairness” we are talking about here; it’s sources of income. Children of some of those old laborers have gone on to college and done quite well. Low-skilled people who have filled in behind them are the ones suffering because there is less and less demand for raw labor. Gates, Musk and others have been warning that we ain’t seen nothin’ yet. As AI replaces maybe half the low-skill jobs in the next few years, they argue, we had better find a way other than typical employment to sustain the masses, or else. I wish the color scale was reversed as my brain automatically thinks red = bad.